The best pool table maintenance tips are to keep it clean with a brush or micro-fiber towel and do it frequently. It’s important to take care of your pool table and to know how to properly care for it so it will last a life time. 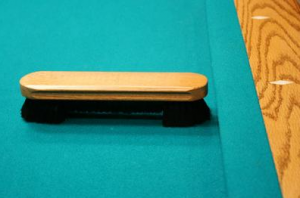 And remember, by not performing these pool table maintenance tips, your table will also affect your overall game, not to mention cost you money on repairs and felt replacement. Note: With a new table, the cloth may interact with the roll of the balls during the break in period. This is completely normal. However, to speed up the break-in process, it helps to brush the cloth as frequently (and properly) as possible. The table, whether it’s new or used, should be brushed before and after every game played. Always brush the cloth in the same direction and never use circular motions. The surface may be vacuumed if necessary, again, always in the same direction and only with a vacuum that does not have a “beater” or one that has direct suction. To avoid exposure to humidity, spills and other hazards, cover your table when not in use. If your table doesn’t return the balls, avoid excessive ball build up or storage in the pockets of your table. The balls will wear out the cloth around the pockets if they cannot drop freely inside and stored balls for lengthy periods may stretch the pockets depending on what material they are made from. If your table has a natural wood finish, it should be dusted and cleaned frequently. Wood finishes can be restored by using a non-residue forming dusting agent, such as lemon oil. Never use a cleaner that contains ammonia as it can chemically damage the finish. Though it is possible to re-finish the wood if staining occurs, prevention is the best measure. Taking general care of the wood on the rails will lengthen the life of the table and reduce the possible cost of repairs in the future. Be careful with food and drinks! Never set a can, glass or bottle on any part of the table. The moisture will cause damage and will also leave stains. If there is a spill clean it up right away. A good method is to sprinkle baking soda over liquid spills, let it set for about 15 minutes and then carefully clean it off the table. If a stain is left, use a mild cleaning product, preferably one made for this application. Keep unnecessary weight off of the table and do not sit or stand on any part of the table. You will affect the table leverage and the balls will not travel as they should. These pool table maintenance tips will help to preserve your table as long as possible but only if you do them! For other tips, here’s another good article. Do you have any pool table maintenance tips to share? We’d love to hear them. Please share in the comments. Or, if you have any specific questions, let us know! Break Pool Cues – Does Weight Matter?